Lounge chair with polished aluminium four-star pedestal base and high backrest, provided with return and tilt mechanisms. The polyurethane shell is upholstered in leather, faux leather, fabric or customer’s fabric. 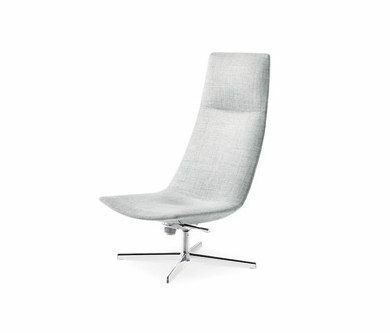 Available also with upholstred polished aluminium armrests. The Catifa project is an on-going “work in progress” inspired by a modern concept of relaxation, luxury and lightness. Catifa 60, a system that includes office and leisure seating, is a further extension of the range. The generous dimensions of the shell make these models comfortable and distinguished while maintaining the sinuous linearity of their design. The Office, Direction and Conference versions are ideal for working environments, boardrooms and meeting rooms. Made of soft polyurethane, Catifa 60’s shell is upholstered in leather, fabric in a wide colour-range, or the customer’s own fabric. It can also be fitted with armrests, covered if required. The base comes in polished aluminium, in a 4- or 5-star version with self-braking castors. Various mechanisms are available for enhanced comfort and functionality: swivel, automatic, gas or gas with tilt repositioning mechanism.